Ed O’Neill’s daughters are doing all right for themselves. Emmy contenders Christina Applegate (NBC’s Up All Night) and Julie Bowen(ABC’s Modern Family) both have called two of O’Neill’s characters dad. And like dutiful daughters, the women compared notes during The Hollywood Reporter‘s comedy actress roundtable. “I grew up with Ed O’Neill andKatey Sagal as parents, so anything that I’ve done well or poorly you can blame pretty much on them,” said Applegate, who played daughter to O’Neill’s lovably crass Al Bundy on Married … With Children. Surrounded by family, friends, and cast mates, the Emmy-nominated actor accepted the honor on Tuesday. Modern Family patriarch Ed O’Neill finally received a star on the Hollywood Walk of Fame in Los Angeles on Tuesday. ABC’s Modern Family returns for Season 3 on Sept. 21. Season 2 will be available on Blu-ray and DVD on Sept. 20. TiVo Premiere, the world’s first Smart DVR, gives users all the entertainment one could want from TV and the web—and in one place, with one remote and one stunning interface. This has inspired TiVo to find the smartest TV dads just in time for Father’s Day and according to survey findings announced today, America’s most brilliant TV dads should strive to be as dependable as Cliff Huxtable and loving like Cam Tucker, as “play-it-dumb” dads like Al Bundy appear low on the list of top TV Dads. Whether your Dad is brilliant or goofy, there is no doubt he’ll still want a tricked out man cave. In conjunction with the TiVo Brilliant TV Dad’s survey, TiVo has launched its Dad’s Tricked-Out Man Cave Sweepstakes to award one lucky father the man cave he has always wanted. Every dad deserves a place to escape and watch the game in peace, so this Father’s Day, enter Dad for a chance to outfit his pad at http://www.facebook.com/tivo. The prize includes the world’s first Smart DVR – TiVo Premiere, a TiVo Wireless G Network Adapter, one year of FREE TiVo service, and a brand new 46” Samsung LCD HDTV. TiVo Premiere is the world’s only Smart DVR and the perfect gift for dads this year. Not only is it the best at pausing and recording live TV, but what even the smartest dad might not know is that TiVo Premiere provides access to the world’s largest on demand library from services like Netflix, Hulu Plus, Amazon Instant Video, YouTube, Pandora and more. Whether he prefers movies, online programming or live TV, Dad can quickly and easily access all of his favorite actors and television characters through TiVo’s gold-standard user interface and universal search feature. TiVo Premiere also records up to 45 hours of HD programming – much more than any generic DVR – allowing the most Brilliant TV to shine through. Emmy voters made their voices heard, rewarding ‘Modern Family’ with 14 nominations, including nods for Outstanding Comedy Series, Outstanding Writing for a Comedy Series and five nominations for its regular cast members. And it’s the cast that really makes the show, so in honor of the show that this writer thinks is the best comedy since Arrested Development, here are Tonic’s 10 reasons to love Modern Family — the characters. 1. 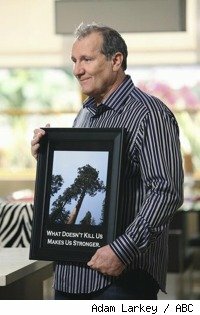 Jay Pritchett — Ed O’Neill plays the show’s father figure and is the reason I started watching the show in the first place, because Al Bundy had returned to his glorious comedic roots. How O’Neill managed to be the only regular adult cast member not nominated for an Emmy is beyond me, but there’s always next year. 2. Claire Dunphy — After displaying her comedic chops on Ed, Julie Bowen’s Claire is the very picture of partly managed frustration in having to deal with four children — her three actual children and her husband, Phil. 3. Phil Dunphy — Phil, played masterfully by Ty Burrell, is a lovable goofball who makes you think he has no idea what he’s doing, as a husband or a father. Ninety percent of the time, that’s a safe assumption, and that’s where so much of his humor lies. Was that what attracted you to the role of Jay, because it was so different from Al Bundy, and so different from the dramatic roles you’ve played? Not so much different from Al, because everything is. But I liked the ensemble nature of the show. That attracted me right away. That the show, there’s a lot of go-to people on the show. So it takes a lot of pressure off, you know? And also it becomes, for me, less boring. You know, you see that person all the time. Especially when you’re doing it every week. It just gets old fast. But this show seemed to have more comedic potential because of the three separate but interconnected families. So how has Jay kind of changed and shifted since the start? (laughing) You know what he’s saying. I think that there’s always a change when the actual actors begin to work with each other on a regular basis and you become friendly… hopefully…you start to like one another. In between takes, you start to share stories and such. And then there’s this sort of a melding, which I love that process, because that’s like the honeymoon, really. And then things begin to become a little warmer, a little more comfortable. You can do things with a little look instead of, you know what I mean? It becomes more real. That’s how it changes. Yes, yes. I like it because it kind of shows that there was some talent in that cast, you know, and some staying power. Alright, just how is it working with Sofia Vergara in most of your scenes? I love playing with her. I really love working with her. I think she’s extraordinarily funny. Of course, she’s not hard to look at. I love the idea that the different culture, and it’s hard enough to understand a woman, you know, in a marriage, in the same culture. And you take a Colombian woman, beautiful, young, and so there’s always the surprises for Jay, things he didn’t quite bargain on, I would imagine, when he married her. Obviously, she was beautiful, and that was thrilling. And now that he’s married, there are puzzling aspects. Ed O’Neill was a hardworking 41-year-old character actor when, in 1987, he was cast as Al Bundy on the Fox TV series Married . . .With Children. The raunchy but hilarious show, featuring the most dysfunctional family on television, lasted 11 seasons and made O’Neill a star. Since then, the likable actor has had a busy TV career, popping up on The West Wing, 8 Simple Rules, John From Cincinnati and as detective Joe Friday in a 2003 remake of Dragnet. Q: Modern Family was a hit from the day it made its debut. What attracted you to the project? A: I liked the fact that there were no jokes, that it was story-driven. I liked the interconnectedness, yet the separateness, of the three families; and I thought there was a lot of room for comedic situations. I liked that it was so ensemble. That’s my theater background. Q: Your character is an older, successful guy married to Gloria, a Colombian hottie (Sofia Vergara) with a precocious 10-year-old son, Manny (Rico Rodriguez). One of the things that makes Jay endearing is that he’s really trying to be a father to Manny, right? A: The fact he wasn’t the greatest dad the first time around, I think a regret is there. Now that he’s got another chance, even though I think Manny was not part of the bargain originally, now that he’s got him, he’s enjoying it. He’s basically a good guy, anyway. Ed O’Neill, who used to play Al Bundy, now plays Jay Pritchett. Ed’s IMDb page can be found here. How do you think Al Bundy would deal with a gay son?